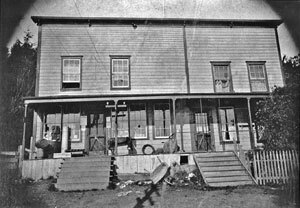 Whonnock’s first general store and post office. First Nations people lived here since time immemorial—thousands of years—when Simon Fraser passed Whonnock in the summer of 1808. Some 25 years before Fraser came downriver the village had been hit fiercely by the first wave of smallpox to hit the region and there were only a few survivors peopling the land around Whonnock Creek. The first permanent white settler and landowner in Whonnock was the Scot Robert Robertson who settled in Whonnock in 1861. Few followed his example until around 1885, when the railroad came to Whonnock bringing new settlers. They adopted the name of its resident First Nation for their community, Whonnock, in a variety of contested spellings. From 1885 onward Whonnock rapidly became the focal point for settlers all over the eastern part of Maple Ridge as well as Glen Valley across the Fraser and on lands across the Stave River. Whonnock boasted a railway station, a school, a general store and a number of churches, amenities not available elsewhere for some time. Most of the new residents were of British descent and came from other parts of Canada, but other nationalities were also here. Norwegian immigrants and their descendants played a significant part in the history of the community. In general the settlers made their livelihood fishing and logging. Subsistence farming was essentially the only kind of farming in this poor neighbourhood but a few residents developed small-scale commercial fruit growing and poultry farming as was done elsewhere in Maple Ridge and Mission. From the 1920s until their expulsion in 1942, the Japanese settlers made good use of the soil for extensive berry farming. Lumberyards and mills continue to be active on the waterfront until the present day albeit on a smaller scale than before. Women, through the church and other organizations, played an important part in the shaping of community life. In 1912 they the created and started operating a community hall that remained the centre of social activities for some forty years. It was the precursor of the present Whonnock Lake Centre.